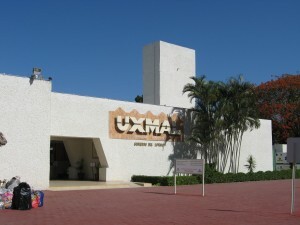 As soon as we entered the grounds of Uxmal, we stopped. This first sight of the Pyramid of the Magician was so much more. . .well, magical than anything we had seen so far. In fact, the best term to capture my response might be rapt—especially apt since we visited the site on the day of the predicted Rapture. We’d driven down from Mérida early in the morning, having already learned that the only way to beat both the heat and the crowds was to arrive the minute the sites opened (usually at 8 a.m.). 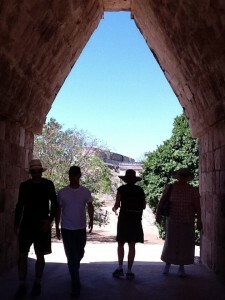 We arrived in good time; still, Uxmal was initially less appealing than Chichen Itza—which we first glimpsed through the lovely colonial archways of our hotel, and which we entered by wandering up a pathway lined with ancient Piich (elephant ear), mango and acacia trees. 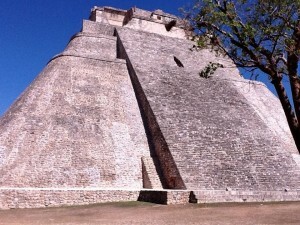 By contrast, Uxmal appeared, from the outside, much more controlled and regulated. To enter, we had to pass through a concrete patio to buy tickets and be tempted by a range of tourist shops. 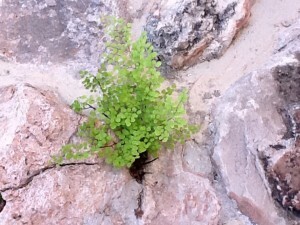 Once we entered the site itself, though, our experience of it was transformed. Although Uxmal has been extensively restored so that tourists can imagine how it (might have) originally looked (see Jo’s post “Who Built Uxmal” for more on this), ironically it seemed less institutionalized than Chichen Itza: the crowds, ropes, and signs that controlled our experience there were far less intrusive here. In addition to providing a less regimented experience of its space, Uxmal is smaller than Chichen Itza and so feels more intimate. Although our first sight of the ruins was spectacular—immediately on entering the gates, you’re faced with the impressively sized Pyramid of the Magician—most of the site is organized into quadrangles. So after moving past the pyramid, we entered an open plaza facing the building dubbed, by the Spaniards, Casa de las Monjas or Nunnery because of its many small rooms or cells. 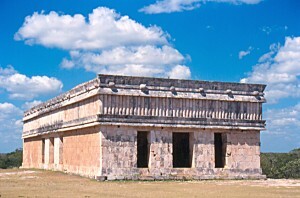 Many of Uxmal’s structures are long and low, with clean–almost classical–lines. 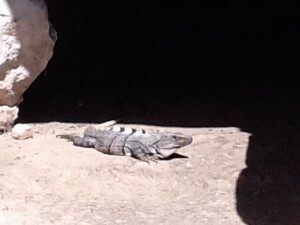 Wandering through the open space, entering the small, cool rooms with their neat piles of as yet unreconstructed stone blocks, I disturbed only a few iguanas. Stephens shares some of the stories behind the buildings, too, and for those who read his or other versions, the tales help to connect visitors to the site. 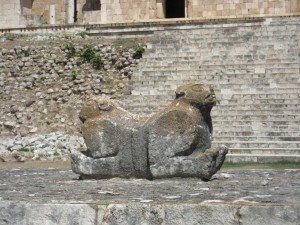 The Pyramid of the Dwarf was, so the Mayan legend tells us, built by a dwarf who, with the help of his mother the bruja or witch, challenged the ruler of Uxmal and won—it’s a kind of David and Goliath tale of a dwarf boy and a woman combining their wit and skill to defeat a powerful king. Then there’s the myth to explain the House of the Turtles: supposedly, the Maya regarded turtles as similar to humans in that they suffered during months of drought and therefore prayed to the same god humans did, the rain god Chaac, who covers the buildings of Uxmal (and no wonder, since there are no cenotes or other reliable sources of water at the site). 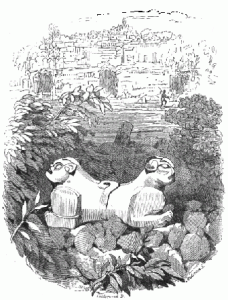 Miguel makes me wonder: what quest are we on today, as we follow in the footsteps of these Anglo-American explorers? 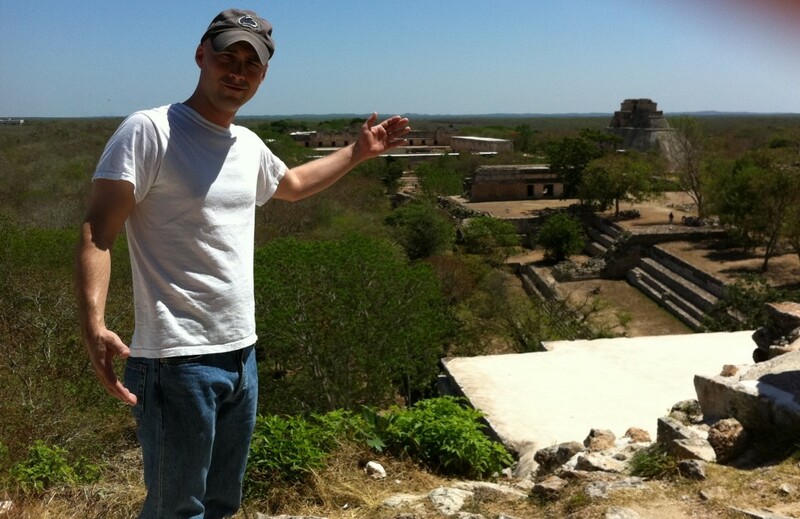 As we tour these archeological sites, aren’t we participating in the same fetishization and commodification of indigenous cultures that Stephens carried out in 1843 (see Matt’s “Who Owns the Maya” posts)?